Shaikha Al Mazrou received her bachelor’s degree in 2010 from the College of Fine Arts & Design at the University of Sharjah, where she studied geometric abstraction and color theory to develop and strengthen her artistic focus. Al Mazrou has exhibited her work at many venues, including the Canberra Contemporary Art Space in Australia, Asian Art Biennale in Bangladesh, Artwork-MKUK in London, Sharjah Art Museum in the UAE, and the Tenri Cultural Institute in New York. She was also an artist-in-residence through the A.i.R. Dubai Program. Al Mazrou currently resides in England, where she is pursuing a master’s degree in fine art at Chelsea College of Arts. 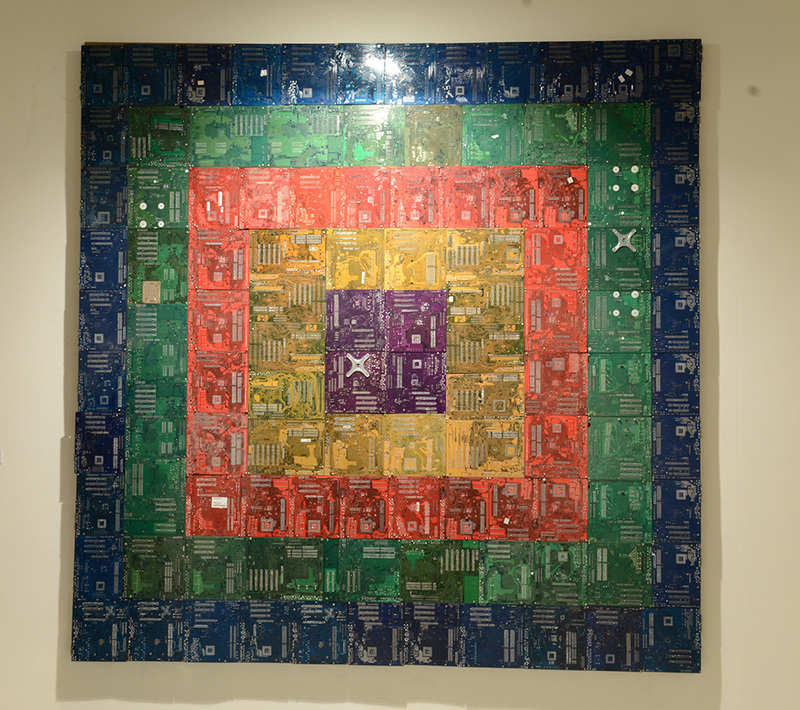 As the UAE is growing and witnessing development in myriad fields, Shaikha Al Mazrou investigates society’s consumption of mass-produced objects by repurposing electronic waste, such as circuit boards, for her large-scale installations. These ready-made objects coalesce to create an artwork that primarily focuses on color and form. Her layered reliefs and illusion-based sculptures challenge the viewer’s perception of space by constructing colorful patterns that produce a kinetic energy. In Inside Out, Al Mazrou intends for the viewer to have an instinctive and physical response to the structure, color, and surrounding space. In addition, the repetition of form highlights the idea of production, consumer value, and craftsmanship.